Mackay is a contemporary typeface created & published by Rene Bieder which is available in 12 styles, 6 weights and italics and a variety of OpenType features. It is characterized by calligraphic details, narrewer structure, italic angle at 14º, new shapes for many lowercase glyphs etc. It merge well on both, large x-height and small descender. This family font it was designed to be suitable for screen and print but also it can be use for editorial purpose, magazine, logo, poster, packaging, web etc. 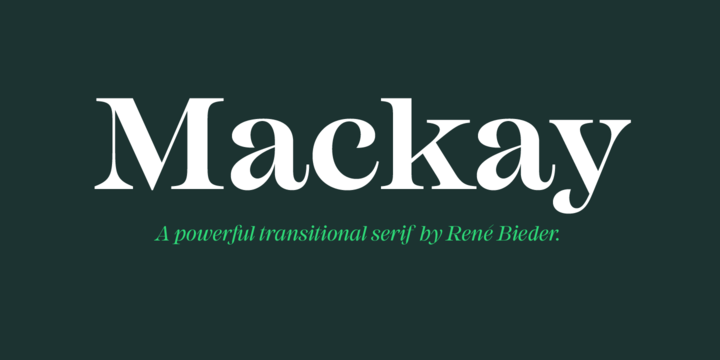 Mackay font cannot be missed! Styles: Regular, Medium, SemiBold, Bold, XBold, Black, Italics. A font description published on Tuesday, June 5th, 2018 in Fonts, Rene Bieder, Rene Bieder by Alexandra that has 1,460 views.